Welcome to the 49th Metamorphosis Monday! Today is the last Metamorphosis Monday before Christmas…so I thought I’d share a few pics of the metamorphosis my home goes through each year around this time. I love wreaths…can you tell? I tend to decorate very traditionally…just love the Christmas reds, greens, and golds. (Warning: This post is picture intensive.) Hope you enjoy! This pic was taken last year. This year, I replaced all the old, weathered hanging ribbons with a good bit wider ribbon, and I think it looks a lot better. Do you think the bluebirds who nest here in the dove cote each spring would be pleased? 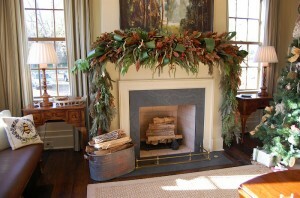 Family room: I love fresh greenery for the mantle. I always head over to a local tree lot and ask for their scraps on a Friday or Saturday night when they are busy and have an abundance of scraps/trimmings. They are always happy to get rid of them since it’s less for them to burn. I don’t remove the decorative pieces that are on my mantel year ’round. I just add the greenery around them. I love wrapping the presents each year. Making bows is really easy and goes quickly once you know how to make one. I purchase ribbon all year long as I find it on sale at Dollar Tree or Old Time Pottery. Even The Home Depot is a great place to buy ribbon inexpensively at Christmas time. Do you remember these as a child? After seeing this adorable gingerbread house in Bab’s tablescape on Saturday, I made a beeline to Bath & Body Works to get my own. They are on sale right now…only $20. If your local B & B Works doesn’t have any left, you may still order them online and shipping is only around $5, per Katherine at Lady Katherine Tea Parlor. Thanks for sharing that information, Katherine! 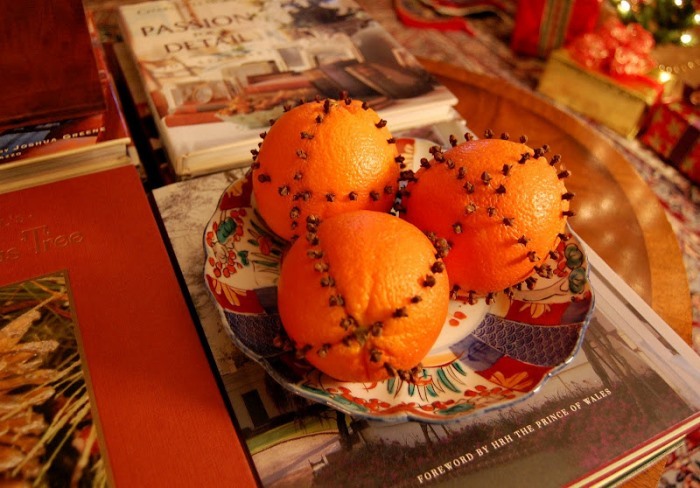 I found an easier way this year to press the cloves into the oranges. Just use an ice pick or skinny nail to make the holes, in the pattern of your choice. It makes poking the cloves into the orange a lot easier, and the whole process goes much faster. A little tree lights up the porch for the Christmas season. Dining Room: A couple of years ago, I added this wreath to the dining room mirror for Christmas. I stuck red berries into it that year. I liked the look of the wreath so much, I decided to leave it there once Christmas was over, minus the red berries. Kitchen: I saw this done on an historic home tour one year…I love the look! I’d like to find some fatter wreaths, though…but these will do for now. This corner in the kitchen looks like it was designed to hold a Christmas tree. This is the “family” tree, filled with ornaments from family vacations and the most treasured of all, those made by my son as he was growing up. I bet you have a tree just like this in your home, too. It’s my favorite tree to see when visiting someone’s home….they are always so special. Designer trees are nice…and beautiful…love seeing those, too. But the tree with all the ornaments we collect over the span of our lives…those are truly special. I just liked this shot with the deer head on the cuckoo clock silhouetted against the wall. See the little angel on the top of the tree? I made her around 26 years ago…back in my crafty days. I’m surprised she is still holding together all these years later. And place them on the tree each day. Guest Room: I love that you get to enjoy the wreaths from the inside, too. 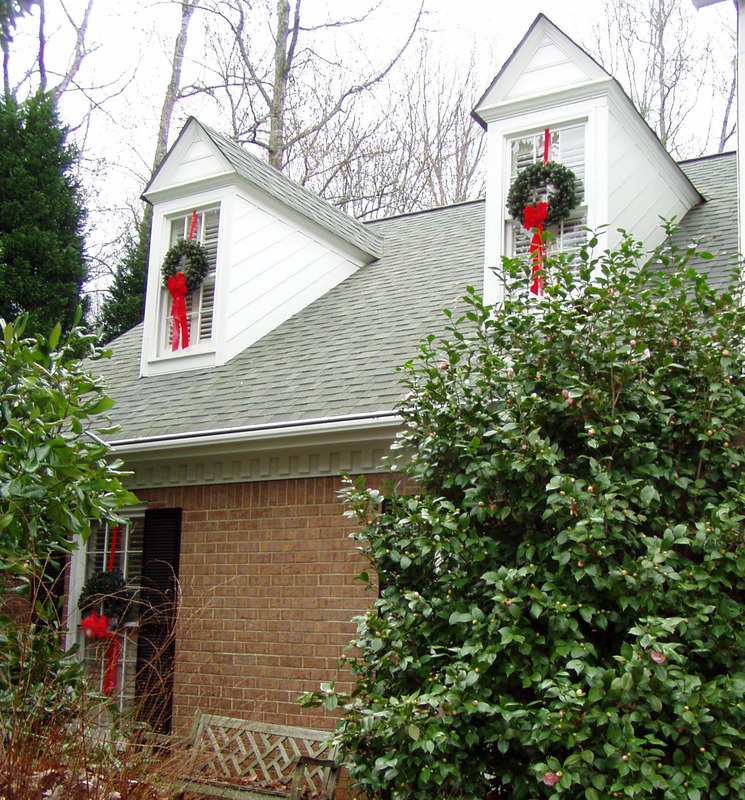 If you’ve thought about putting the wreaths on your windows, do it! You’ll love it…totally worth the effort and you can reuse them year after year. This little doll house was decorated for Christmas when I first discovered it at a local antique shop. I replaced the decorations with some I made, since the ones it had were crumbling apart with age. Now, I’m toying with the idea of removing the Christmas decorations so it will work well for any time of year. Ummm, maybe I can find a way to attach the decorations just for Christmas each year. I’ve been inspired by the way Kim at Daisy Cottagehas decorated her darling doll house with painted furniture. I’ve never furnished this one because all the fancy furniture I found just didn’t seem to be right for it. Once I saw the painted furniture in Kim’s, I knew what this little house needed. The upstairs family room has a bit of a nautical theme. Thanks, Bonnie, for sending this pic to remind us all to take some time to pamper ourselves just a bit during the holiday rush. I couldn’t stop laughing when I saw it! Merry Christmas, Everyone! If you are participating in Metamorphosis Monday, please be sure to add your permalink below, and not your general blog address. Your photos are beautiful and I especially love the snowman in the tub. All of your wreaths are beautiful! In the butlers pantry, the white in the dining room, and my favorite on the clock. Oh, Susan, your pictures are wonderful! Loved looking through your home; it's splendid! Love all your wreaths and decorations! Thank you for sharing and Merry Christmas to you and your family. oH, Susan…this is the most beautiful post. Your home is so pretty…actually, it is magnificent. All your decorations are in such excellent taste…you have a way of putting things together that look like a million dollars. Have a wonderful and blessed Christmas with your family…. This has been a fabulous year of blogging and I have enjoyed YOUR blog so much! Susan, Your house is absolutely beautiful! How many wreaths?? I stopped counting after 30! (And I didn't count the ones on the doll house.) Your house looks so warm and inviting. Makes you want to come and visit! Gorgeous, and I'm in love with Max! Snowman at the end was a hoot. Your house is always so beautiful but especially at Christmas. Love your beautiful trees and those gorgeous bows; mine never look that perfect–I have serious bow-envy 🙂 Thanks so much again for hosting and I hope you and your family have a wonderful Christmas. Thank for hosting! You home looks lovely! Happy holidays! You have a lovely home. I also have a swarovski snowflake tree (13 years) and enjoy it, especially on sunny days! I was a bit disappointed in the simple design this year, but had to buy it anyway!! Thanks for hosting Met Mon…and have a wonderful holiday. You are such a sweetheart! Your home is gorgeous – so inspiring and always absolutely beautiful and a joy to see. Your Christmas decorating is no exception… love it all and what a treat it was to see. Thank you! AND I can't wait 'till you decorate your own adorable dollhouse so that I can be inspired by YOU. It will be fabulous, for sure. Thanks for the tour — your pictures are wonderful and your home is lovely — now that snowman in the tub is just too cute! Susan – your house is absolutely beautiful – but even better than that, it's welcoming. I've seen many stunning homes that just don't feel nice, your's makes me want to come and sit for a visit! Hi Susan – love the little wreaths on the kitchen cabinet doors! As I take down the Christmas decorations mid January, I will look to your house for inspiration as I decorate mine. Oh I love that sweet dollhouse. I just pulled one out of the trash not long ago. I'm not sure I'll furnish mine either. I plan on using it in my dining room to store extra linens in. I figure I can decorate the outside for the holidays like you did! Very cute! Your Blog is my favorite MAGAZINE… even over my once beloved Southern Living Magazine I would recieve in the mail monthly. THANK YOU for sharing your for decorating! Stop by my garden sometime. I went on a HOLIDAY GREEN TOUR this year sharing what Garden Centers were sharing for the holiday season. Susan-Love it all! I remember the wreaths in the kitchen and I think that is my favorite! I am so envious of your TWO grandfather clocks–I have wanted one ever since watching the one on Captain Kangaroo when I was a child 🙂 Merry Christmas–it's was all worth it! Everything looks great! Looks like you're all set and ready to go. Beautiful decorations-your home looks so welcoming and cozy. Too bad we can't enjoy those Christmas decorations longer, huh? 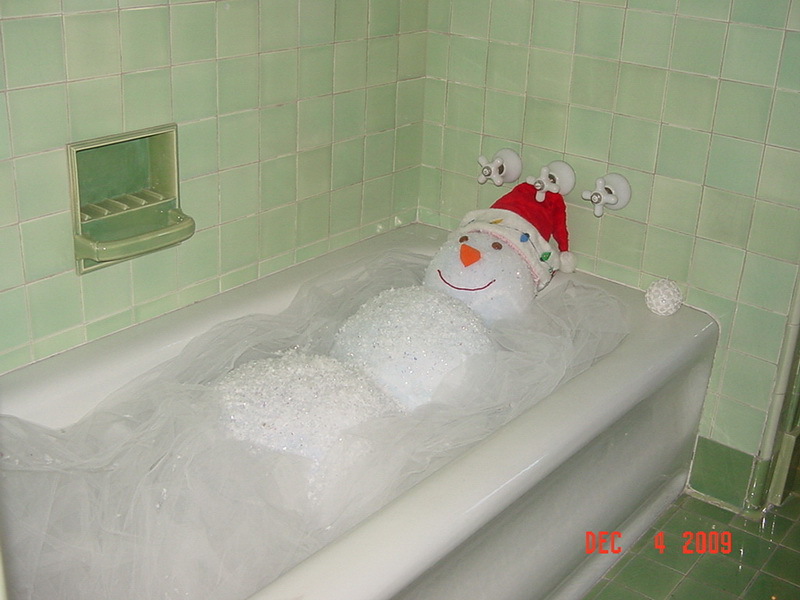 Loved the snowman–I posted a pic last week of bathtub decorations that one of my friends did too that was sooo cute. It was with big ornaments that looked like bubbles–she needs to add the snowman now. Merry Christmas! I am so inspired by your beautiful home and all your decorating expertise. I started following your blog months ago and just had to start a blog of my own. I am not in a season of life where I can dedicate a large amount of time to this but it is my secret indulgence. 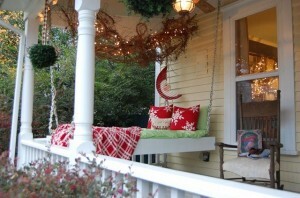 I hope to have a beautful porch to nap on in the future. Until then, I will visit often and get fantastic ideas from you. Have a very Merry Christmas. Wonderful post, Susan. I enjoyed viewing all of your lovely Christmas decorations! Oh, I forgot to tell you… after seeing that adorable ornament of the mice with the spectacles I went in search. I couldn't find the same ones as yours but, another one in the series was selling for $85. Isn't that amazing? You knew you had a treasure didn't you. I bet you never thought it would go to that price when you bought it did you? Also, loved the snowman in the tub. Think I'm off to do the same thing… soak in some bubbles. Merry Chrismas my friend. Susan, Everything is just beautiful! I love all of your Chirstmas decorations and look forward to everyone of your posts throughtout the year. Thanks for being such an inspiration with your beautiful home. Everything looks wonderful. Happy Holidays to you and your family. Your home is so beautiful. I love all the wreaths everywhere. Thanks for sharing you home with us and for hosting the party. Your home is absolutely gorgeous all decked out for Christmas. I just love all the traditional red, green & gold. Thanks for hosting us every week. Everything is so wonderfully festive and gorgeous!! So many things that I loved! The sled by the door with the ice skates is so charming. The silver wreath in front of your mirror-amazing! I also hung little wreaths from my kitchen cabinets this year. I love the way it looks! Susan, what a treat to tour your home dressed for Christmas. Each room is perfect! Lucky for us and all who enter your charming abode that you are a perfectionist. Not a bad trait! I wish you and your family a very merry holiday. I think I recall that you said your son and his girlfriend will be at home with your for Christmas. How splendid! Ooooh I love al the wreaths on the windows!!! Merry Christmas to you! I enjoyed the tour of your home so much. Everthing is just beautiful. Simply gorgeous, Susan. Love your packages – it's a passion we share! Merry Christmas! Stunning……It has been such a blessing to meet you in blogland…You have enriched my life. Blessings to you and yours….Merry Christmas and a New Year filled with many blessings. Your home is lovely. The wreaths are really quite striking, inside and out, and the Snowman is a hoot. Thanks for sharing. I think you needed a few days to realize all these beautiful decorations! Congratulations and thank you so much for sharing this! PS Thank you so much for the sweet comments on my blog! You are so sweet! Lynne is right. Your house could be in a magazine! Everything is beautiful! Merry Christmas! What a beautiful Christmas home! I love the wreaths on the kitchen cabinets. I will have to borrow that bathtub snowman idea next year. It is too cute. Everything else is just beautiful. Susan everthing is so beautiful and decorated so wonderful at your home for the holidays. Have a wonderful christmas and new year! And another year of wonderful blogging. Dear Susann, Your home is amazing! It's so beautiful and you always have such wonderful ideas. I just wanted to pop over to wish you and your family a very Merry Christmas and a Happy New Year. I hope tons of blessings come your way this holiday season and always. Oh, Susan, what wonderful photos! Thank you, thank you for this tour of your home. Your house SHOULD BE on a tour of homes for Christmas! Susan, I agree that your home should be in a magazine. Everything is just gorgeous! I tend to stay with the greens & reds too with additions of silver and gold. Just feels like Christmas to me! 🙂 My mother always used nandina berries ~ a very nice memory. The tree in the kitchen, the wreaths, your beautiful bows, the mirror I covet in your dining area ~ just love it! Oh your sweet kitty is loves the camera. Love the snowman, made me laugh. Thank you for sharing your beautiful home with us! It is a treat to visit and filled with wonderful inspiration. Wishing you and your family a Merry Christmas! I love your home all decked out for the holidays! So lovely! It reminds me of Williamsburg- where our family vacations every year. Thanks for taking the time to do this at such a busy time. Beautiful, beautiful decorating!! You certainly are good at this. Some ideas that I will be storing away. If this were a magazine, I would rip out the pictures are save them in my inspiration notebook. Wishes for a very Merry Christmas. What a beautiful transformation you home takes for the holiday. I love the little bery wreathes on your grandfather clocks! I also lvoe the wreath on the kitchen door. Thank you for sharing your home with us. Everything looks wonderful, Susan! You never cease to amaze me with your energy, creativity, and attention to detail. Thank you for sharing the welcoming warmth of your beautiful home! OMG! Your home is gorgeous!!!! It's so festive and cheery. Thank you so much for sharing these lovely pictures of your home. Merry Christmas. 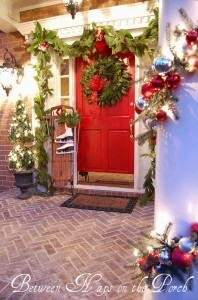 I truly love seeing all the different rooms decorated in your home for Christmas. It must take you a long time to take everything down and store it away after the holidays though. That's the part I hate…putting things away. Yes, your Christmas decor is traditionally fabulous! I love the sled and ice skates by the front door. I've always wanted to do that, too. A couple of years ago, I saw some vintage ice skates in an antique shop and just KNEW I should have bought them~! 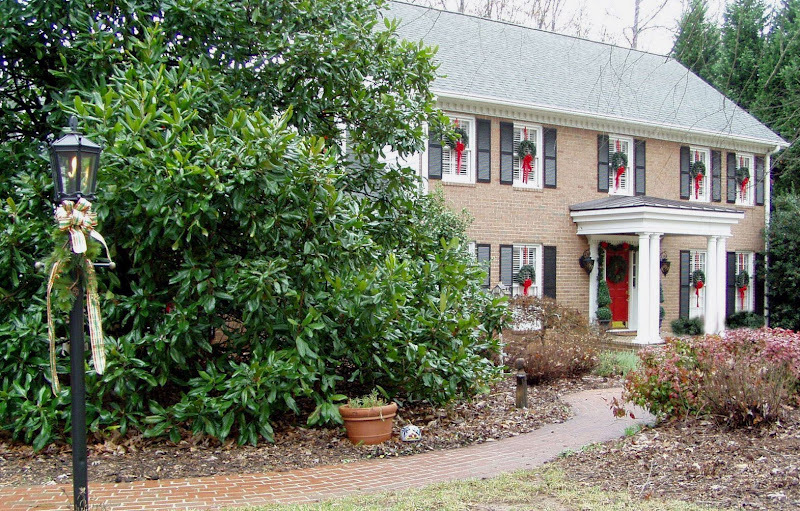 And um – with all the trees 'n wreaths 'n things, how LONG did it take you to decorate your home for Christmas? Whew! I am also a huge, huge fan of fresh greenery!! That is a really great idea about getting the tree scraps for free. I've always made wreaths out of our tree scraps…but can't do as much with that part of it since we've switched to a smaller live tree (table top) every year. I love big trees – but hated that it took over 8 hours just to string the lights on 'em! Your decorations are just heavenly. I'm particulary fond of wreaths and I love where you've chosen to use them. Have a Merry Christmas. All your holiday decor, inside and out, is just fabulous. The traditional style is so warm and the red and green with gold is excellent. I especially enjoy your use of wreaths — it gives unity to the decor. How very beautiful you have made your home this Christmas. It deserves to be in `A Design Magazine'. Have a wonderful Christmas in your beautiful home. Peace and love to you and all this Christmas Season. I agree with Lynne–your home belongs in a magazine, a book, or both. A visit to the porch is always a joy. It radiates your warmth and generosity. I hope you are having a blessed holiday! I have LOSTED your email! 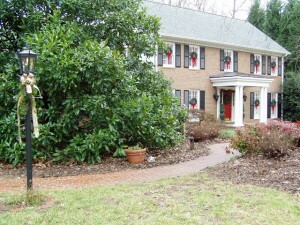 Susan..it was a thrill to view your home for the holidays! It's very beautiful and it's like flipping through pages of one of the best Home Decor magazines…Merry Christmas to you and your family..Hugs! Since the next few days are going to be crazy I want to wish you all a early Merry Christmas.. thanks for letting me view your life and visiting mine. Ok, that snowman in the tub is stinkin' hysterical!! I gotta do that!! Your home is as gorgeous as always! Thanks so much for all you do to brighten my life with pretty pictures!! Have a very Merry Christmas and a Happy New Year! Love, your favorite stalker! Oh my!! I don't even know where to begin. Your an inspiration. I love all things traditional too. Your little berry wreaths placed everywhere are so cute. My red berries out of the yard are already looking a little dried out. How do you keep yours so fresh? Okay, you got me. I ran outside to look at my wreaths placed on the windows. You are right. They need to be hanging by a red ribbon…my husband is going to love it when he comes home this weekend and I say,"Honey, just one more thing…"
It was so nice meeting you today at my blog…I love finding another great blog to watch :). Susan…My mom made the exact Angel years ago too! I was so excited when I saw her…I am going to have to tell my mom! I so agree about how you hang wreaths! We also use ribbon to give the look of hanging from the window top! What beautiful tables everyone has! I love when you do this post. I spend hours just going to all the blogs and dreaming about sitting down at those tables. Aloha, I love your blog,looking forward to seeing more..
Love it, love it, love it……such great ideas!! You have truly inspired me!! Now I’m off to start decorating! !